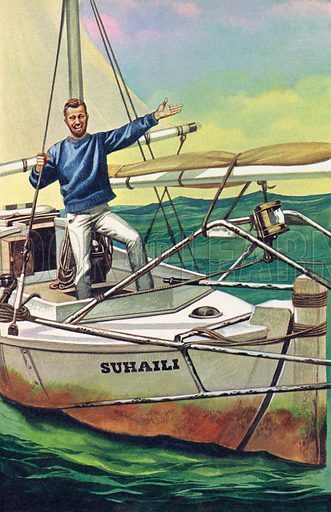 This maritime picture shows the English sailor, Robin Knox-Johnston, the first person to circumnavigate the globe non stop and single-handed in his boat Suhaili, for which achievement he was later knighted by the Queen. He gestures expansively on deck not in triumph, but because he is celebrating Christmas Day by energetically singing a carol. Many more pictures of sailors can be found at the Look and Learn picture library.